Curved surface area of a solid is the measurement of outer area,where the extension of top and bottom portion wont be included. 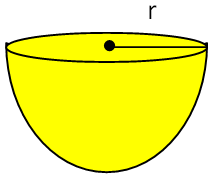 If a rectangle revolves about one side and completes one full rotation, the solid thus formed is called a right circular cylinder. 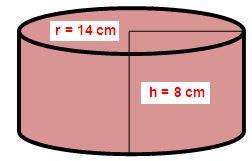 The above picture shows that how rectangle forms a right circular cylinder. In other words curved surface area can be simply said as CSA. 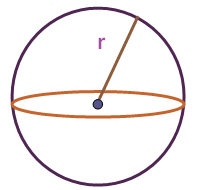 "r" and "h" stands for radius and height of cylinder. If we consider the shapes like sphere, both total surface area and CSA would be same. 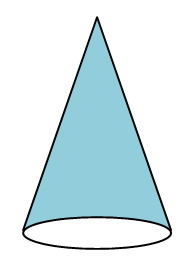 And for the shapes like cone, we don't have any specific shape at the top portion. But we have the circle at the base (bottom). So when we want to find the CSA of a cone, we need to find the area that exclude the extension of the bottom portion or base.In the top portion. We don't need to exclude anything. Because there will be only one vertex at the top.So we don't have to exclude any thing at the top when we want to find CSA of cone. Curved surface area and circumference at the base of a solid right circular cylinder are 4400 sq.cm and 110 cm respectively. Find its height and diameter. A mansion has 12 right cylindrical pillars each having radius 50 cm and height 3.5 m. Find the cost to paint the lateral surface of pillars at $ 20 per square meter. 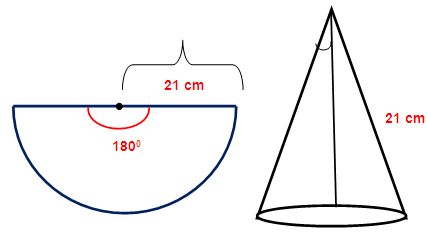 If the circumference of the base of the solid right circular cone is 236 and its slant height is 12 cm, find its CSA. If the curved surface area of solid sphere is 98.56 cm², then find the radius of the sphere. If the curved surface area of the solid hemisphere is 2772 sq.cm, then find its radius. Find the CSA of a hollow hemisphere whose outer and inner radii are 4.2 cm and 2.1 cm respectively.